A quest for discovery requires a dedicated team of scientists motivated by their desire to explore and fuelled by their passion to make a difference to their community – at NeuRA we pride ourselves on our ability to collaborate across disciplines to find the best answers. Click the image below or click 2018 NeuRA Profile to download a copy as a PDF (4MB). ‘Discovery’ is not just a word associated with our quest to explore space and time, it is also the mantra we live and breathe at NeuRA. We are excited to share a snapshot of these projects which will frame the goals of NeuRA over the coming twelve months. The most significant health care issue of our time is the continued existence of diseases for which we do not yet have answers. Let’s find a way to cure them. That’s what we want our research to achieve. Advances in neuroscience are unfolding at a breathtaking pace as we seek to transform medical research into real-world improvements in human health. 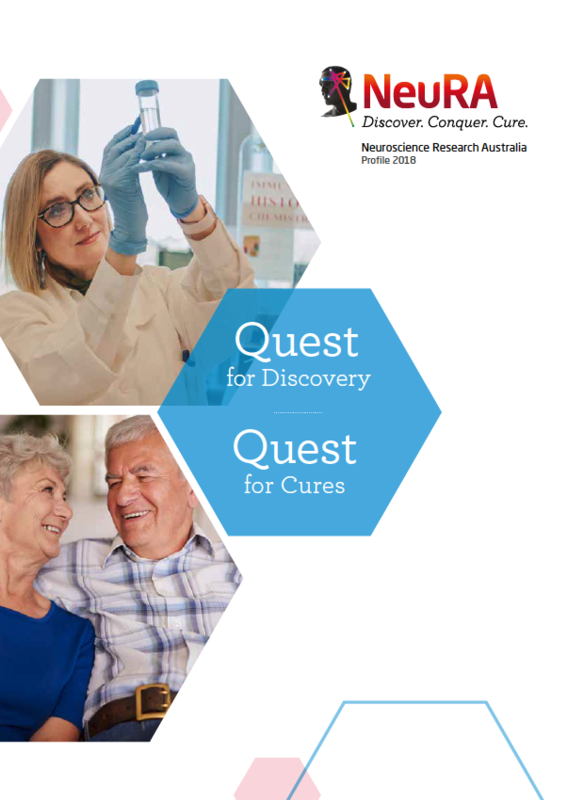 We’re excited to open our laboratory doors and share some of our most significant clinical and translational research in the pages that follow. NeuRA’s capacity to tackle society’s health challenges is the greatest it has ever been. The size and scope of our new research facility are indicative of the burden brain diseases will have on humanity into the future – unless we can bring together the best minds in science and medicine. With this new facility, we are doing exactly that. With the opening of the NeuRA building, the first stage of the Neuroscience Research Precinct, we look forward to the future as we explore the remarkable research opportunities that now open up before us. Today we have an unprecedented opportunity, through the diversity of our research, to become a global hub for scientific investigation and bring about huge changes in the diagnosis and treatment of so many diseases. We invite you to explore highlights of our research and discoveries. You will also meet the people who make these discoveries possible: the researchers who give their passion and dedication, and the supporters who give their time as research volunteers and their financial support as donors. All these people are advocates of the same vision: to cure diseases and disorders of the brain and nervous system. In 2010, this vibrant and productive place became Neuroscience Research Australia. We invite you to explore these pages and discover for yourself what we do and how much we have achieved this year. While our scientists have profound challenges to address, our capacity for finding answers is growing day by day. If we keep an open mind to the possibilities, just imagine what we can achieve together. Neuroscience Research Australia (NeuRA) is more than just a new name. It is a demonstration of our achievements and ambitions, our independence, our collaboration and our internationally recognised leadership in research. We invite you to discover the incredible work that Neuroscience Research Australia is doing for Australia and for the world. Our researchers are finding new ways to take on old medical problems — and new ways to take on new ones. They are the innovators. They are battling problems that have no simple cause or solution. Innovation, leading to new medical research discoveries, is the key. Neuroscience, the study of the brain and nervous system, presents the greatest challenge known to man. Our brain is the most complex mechanism we have ever encountered and understanding its intricacies requires a profound research commitment. When disrupted, disorders of the brain and nervous system pose the largest health, economic and social capital burden to Australia of any disease group. The outlook for 2007 and beyond is truly remarkable. Through scientific tenacity we will continue to conduct world-class, collaborative medical research to cure human disease, improve quality of life, and create a legacy for the future. The opportunities to translate our work into clinical therapies, creating a natural synergy amongst our researchers, are impressive. Through scientific tenacity we will continue to conduct world-class, collaborative medical research to cure human disease, improve quality of life, and thus create a legacy for the future. Neuroscience Research Australia has an established international record of research leadership in spinal cord, nerve and impact injury, pain mechanisms, vestibular function and falls, neural regulation of autonomic function and breathing and neurodegenerative diseases. The Spinal Injuries Research Centre within NeuRA developed rapidly during this year, with five active laboratory groups working principally in this area, and others planned. This area of our work gained impetus from the very successful fundraising event. The official opening of the Stage II building works of NeuRA by Premier Bob Carr in November last year saw the commencement of a new period of rapid growth of NeuRA’s research. The expanded laboratory space available made it possible for us to recruit outstanding new researchers to our cause and immediately there was a large increase in the income derived from competitively earned research grants from external agencies.